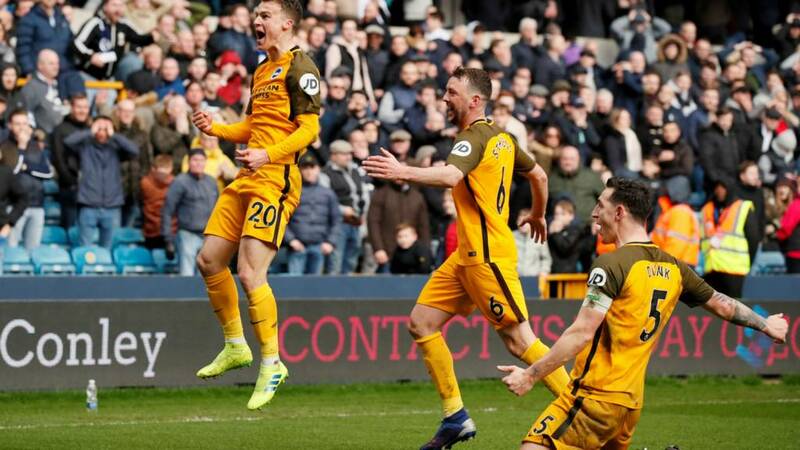 The teams couldn't be separated in extra time and Brighton won it on a shootout. They'll play Manchester City in their first FA Cup semi-final since 1983. Click here to watch all of this weekend's Premier League goals or head over here to follow Everton v Chelsea in the Premier League. Millwall manager Neil Harris, speaking to BBC One: "I thought the players were outstanding. What a performance for 94 minutes. I am a little more disappointed with the first goal. The second was an individual error. [Millwall goalkeeper] David Martin is one of the best pros I have come across. He is a great lad, so popular. He deserved his opportunity to come into the team last week. He was outstanding for the whole game baring one moment. That is football. "I am a big believer of whoever misses the first penalty wins the shootout. I wasn't confident. Shane Ferguson is our best penalty taker and wasn't on the pitch because of a moment of stupidity. The players put themselves forward so I have no problems with them missing at all. "I am frustrated. Missing the chance to lead the team in an FA Cup semi-final is a huge frustration for myself, staff, players and fans." We shouldn't really have had penalties. Brighton scored this in the final minute of extra time but it was incorrectly ruled out for offside. Just look how much it meant to Brighton's players. They must have thought they were going out when 2-0 down. Brighton manager Chris Hughton on the semi-final draw: "All three other teams probably didn't want to play Man City but at the moment we are so pleased to go through and if we don't think we can win, then there is no point going into the tie. We are up against one of the best sides in the country, but on the day, we have a chance and we will have to have everything go our way." Brighton manager Chris Hughton said: "I think that was what you call a proper cup tie. I didn't think we did well enough in the early part of the game. This is a very difficult place and they have history in this competition, but it's about character and we had a group of players that decided they desperately wanted to stay in this competition." On the equaliser: "As soon as Solly [March] played the ball in, we were disappointed because he over hit it but sometimes you need those moments. We probably didn't create enough of them but we had a bit of fortune to swing it our way. "We were confident in the penalty shootout, but when you miss the first one and they score, you think it may not be our day. But we showed enough with our remaining takers and I think we showed more over the 90 minutes." Jake Cooper missed in sudden death after Lewis Dunk had scored. In other news, Brighton progressing to semi-finals means Tottenham's first game at their new stadium will be against Crystal Palace on Wednesday 3 April. Brighton manager Chris Hughton says his team had been practising penalties before the game. He admits a draw against Manchester City was not what he wanted but says they "have a chance". The semi-finals will take place on 6-7 April at Wembley. Jimmy Floyd-Hasselbaink empties the balls from the bag. Brighton captain Lewis Dunk said: "It's crazy. We did it the hard way. We knew it would be difficult and we made it even harder for ourselves going 2-0 down, but it's a great day. It shows what great character we have got under this manager and we never give up. "Massive credit to all the boys and you can hear what it means to the fans. We knew the prize coming here and now we go to Wembley. We have to deal with whoever we get and hopefully we win and go through to the FA Cup final." But then Brighton hit back with a thrilling late comeback. That said, they were given a huge 'helping hand' by Millwall goalkeeper David Martin. He let the ball through his hands in the 95th minute to allow Brighton to equalise. The Seagulls went on to win it on penalties. Millwall were almost in the hat. They were 2-0 up in the 88th minute.